Between then and April 15 — the deadline for the campaigns to turn their fundraising reports to the Federal Election Commission — we're going to find out the state of the Dem money race. Beto O'Rourke ($6.1 million), Bernie Sanders ($5.9 million) and Kamala Harris ($1.5 million) announced having raised the most during their first 24 hours as candidates. Sanders said on Wednesday that he's already received 713,839 contributions, and assuming each is for $27 (his average contribution), he's raised approximately $19 million so far. 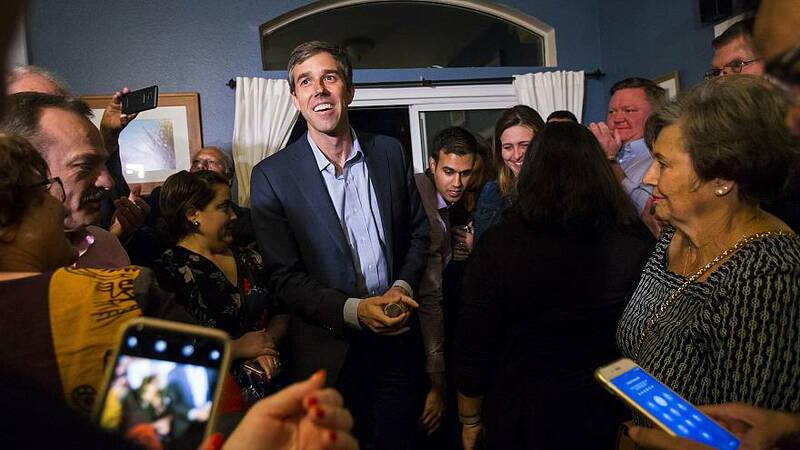 Does O'Rourke (who launched his campaign on March 14) come close to Harris (who launched on January 21) for the entire quarter? How much of John Delaney's personal money has he spent? And don't forget about the money that many of these candidates can transfer from their pre-existing Senate/House accounts - Warren $12.5 million, Gillibrand $10.5 million, Sanders $8.8 million, Klobuchar $4.4 million and Booker $4.1 million. We still don't know what's in the 300-page-plus Mueller report, but we already know one conclusion: bad/unethical/sketchy behavior doesn't equal illegal behavior. Meanwhile, campaigning in Michigan last night, Trump was taking his victory lap after Attorney General Barr's four-page summary of Mueller's report said there was no conspiracy/collusion with the Russian government. "The special counsel completed its report and found no collusion and no obstruction. ...Total exoneration. Complete vindication," Trump said. Except Mueller didn't exonerate the president when it comes to obstruction of justice. "[W]hile this report does not conclude that the President committed a crime, it also does not exonerate him." Trump has forgotten something very important as he's promised to move forward on health care, and as he's claimed the GOP will be the party of health care. Senate Majority Leader Mitch McConnell hasn't forgotten that fact. "I look forward to seeing what the president is proposing and what he can work out with the speaker," McConnell told Politico. He added, "I am focusing on stopping the 'Democrats' Medicare for none' scheme." Bottom line: Health care legislation - or more specifically, GOP-led health care - isn't passing Congress in 2019-2020. On Saturday, Beto O'Rourke holds his kickoff rallies in Texas - starting in El Paso, then hitting Houston and then Austin. And O'Rourke says there will be more than 1,000 watch parties across the country. On the campaign trail Saturday: Besides O'Rourke kickoff in the Lone Star State, Warren, Delaney, Amy Klobuchar, Julian Castro and Tim Ryan are all in Iowa for the Open Markets/HuffPost candidate forum… And Tulsi Gabbard hits Los Angeles. That's the share of Americans who say the president of the United States has done "too little" to distance himself from white nationalists, according to a new survey from the Pew Research Center. Just 29 percent said Trump has done the "right amount" to distance himself from those groups, while seven percent said he has done "too much." As you might expect, there's a yawning partisan gap. More than eight-in-10 Democrats — but just 26 percent of Republicans — believe Trump has done too little. What's perhaps more surprising is that these numbers are virtually unchanged from December 2016, before Trump took office. That means before Charlottesville, the Pittsburgh synagogue shooting and the mosque attacks in New Zealand. Don't miss the pod from yesterday, when we looked at how the narrative about what Democratic voters want isn't always matching up to the data. Trump has reversed course on Special Olympics funding after days of Betsy DeVos's defense of proposed cuts. Kim Jong Un didn't hold back with flattery for the president before last month's summit in Vietnam. Trump's top pick for the No. 3 position at DOJ is withdrawing over years-old ties to an abortion rights organization. Brexit was supposed to happen today. Instead, everyone's just confused. Puerto Rico's governor is talking very tough about the Trump administration. Michael Bennet looks like he's leaning toward a run. POLITICO's latest Hickenlooper headline: "John Hickenlooper Is Running for President As Himself. Uh-Oh." Trump's 2020 team is targeting Virginia for the presidential race.